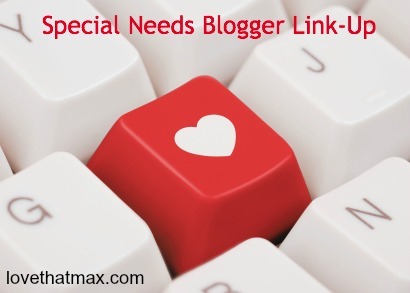 Love That Max : The Special Needs Blogger Weekend Link-up: Go! "The wins between our losses just have to be big enough to keep us moving forward." Thoughts on life, AAC implementation, poker, bad beats, and what to do when you're doing everything right, but not having much success. I'm at #15. I wrote a blog post about Brandenn Bremmer, a 14 year old gifted boy who died of suicide with no known depression, suicide note, of pressure to achieve, and about the self-imposed pressure that nearly ravaged my health and happiness. It's a reminder for people who envy gifted kids and their parents that we don't always have it easier and that our problems are not just minor nuisances. I'm #20. My husband started a new job. I wrote about our second morning without him. Whew! #27. A story about our son's ADHD diagnosis. I will update more as our journey has continued and taken many twists and turns along the way. Thank you very much for hosting this link up! I have some good news- Starting February 1st I have the opportunity to do an internship/ job shadowing class in school. My placement is in a middle school self contained special education classroom. I met with the teacher this week and she said "don't be afraid to ask questions why we are doing something because there's usually a reason we(the staff) are doing something and there is ALWAYS a reason the kids are doing something." I feel that this will be a very beneficial experience for me as a future educator and I'm excited. That's great!!! I'm excited for you, Jack and I are both in a middle school self contained SPED classroom for part of the day and it's really fun. #37 My post is about how difficult it is to go out to events when you are caring for a child with special needs. But it is not impossible, I show you how I prioritize my outings in line with my situation and needs. Such a great link up! Thanks for hosting!